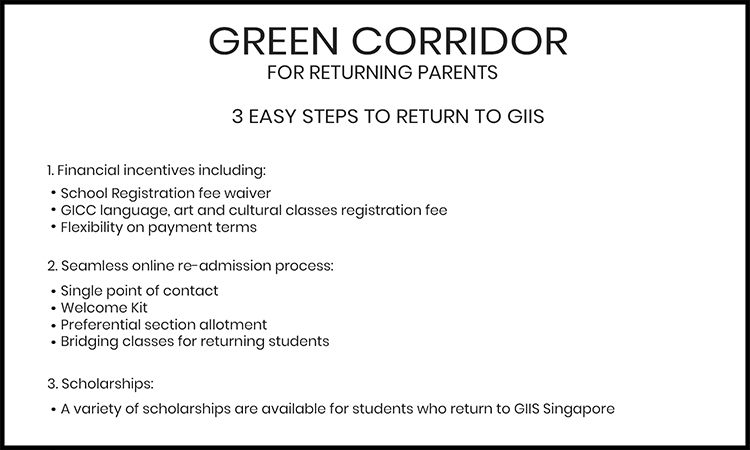 Over the years, many students have returned to the GIIS family from other International schools or chosen GIIS as their first choice upon coming back to Singapore. Many find the facilities, the faculty, and the familiarity the main motivators behind their decision. Most have expressed pleasure on their return and excitement about the sprawling new campus which gives them facilities like wifi in the digitally enhanced classrooms, innovation rooms and learning commons for collaborations, safety features like facial recognition and a clean and green environment to study. 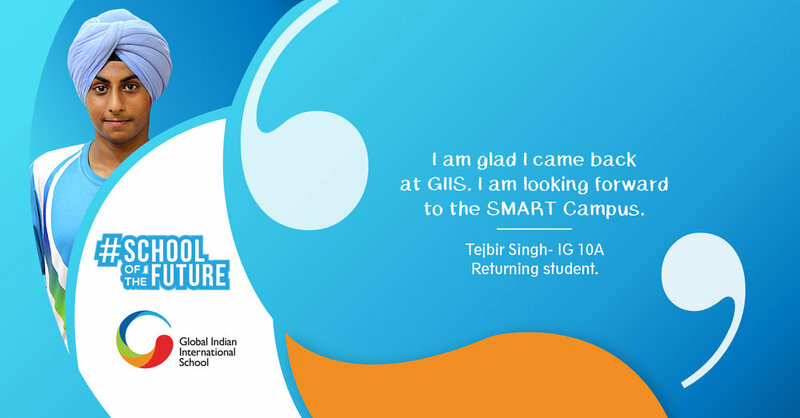 Scroll down to see what our students have to say on their return back to GIIS and our Parent Testimonials on the SMART Campus. For those interested in viewing the SMART Campus, we have organized exclusive Campus Tours wherein you can come and witness all these facilities first hand. Please register your interest through the link below. GIIS welcomes and looks forward to seeing many more students return to their home, GIIS Singapore. It is great to have you back in the GIIS family. Returning from London back to GIIS Singapore was a right choice for Tejbir, as the school has always made him feel comfortable and at home. He is now excited about the Virtual Classrooms at the new SMART Campus and is looking forward to starting his new semester. All the teachers go an extra mile to clear our concern and doubts in GIIS. The schools feels like a 2nd home and a natural calling. I hope to develop my interest in Badminton further in the SMART Campus. Saksham tried another International School for a brief period, but returned soon after. It was a smooth transition returning to GIIS, from admissions to merging back into the campus community. 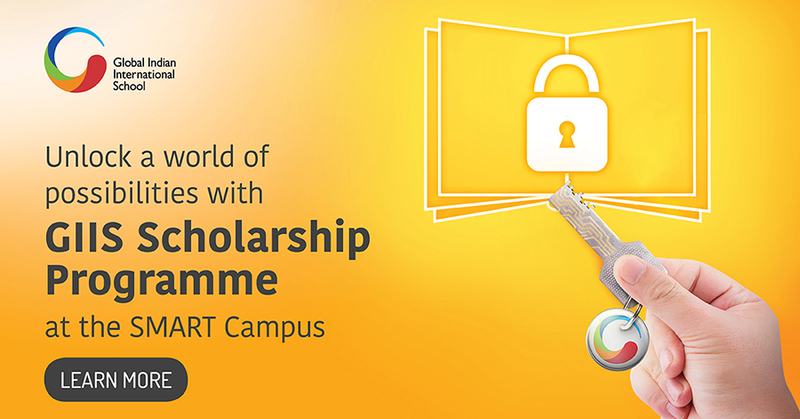 He looks forward to the enhanced sports facilities and particularly the data analytics offered at the SMART Campus. Nivedha came back to GIIS, after experiencing another International School, and is happy to back at an important Board Year. She felt the need to be among teachers who are intuitive to her needs, guide her well and understand her and her requirements. 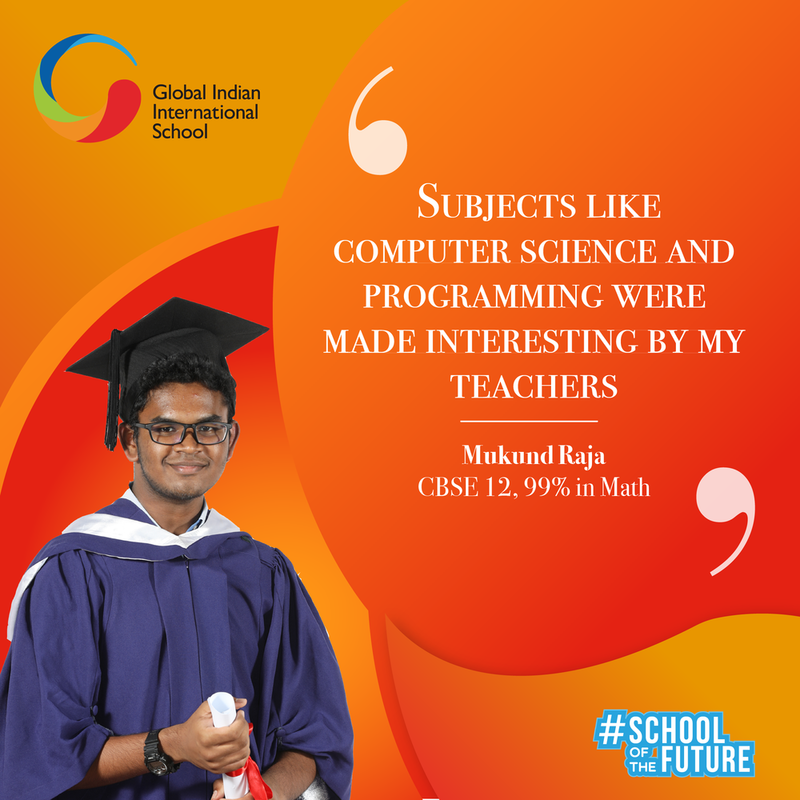 On his return back from India to GIIS, he took up Computer Science and found an interest in the subject because of his teachers. As a computer enthusiast, he is looking forward to the SMART Campus’s Digital Classrooms and new features. Parent speak about how SMART Campus will help enhance students' learning with a balance of academics and co-curricular activities. Mukund Raja aims to be an AI and Cybersecurity specialist. He attributes his inclination towards AI to his teachers who made computer science and programming, interesting and intriguing for him. GIIS wishes Mukund all the best! Shruti Iyer was introduced to Economics in Grade 9 at GIIS. Teachers made the subject interesting for her and she developed a deep interest. Shruti, is going to pursue Economics for higher studies. She appreciates that teachers at GIIS make learning easy. Kudos to Shruti and all the best for future! 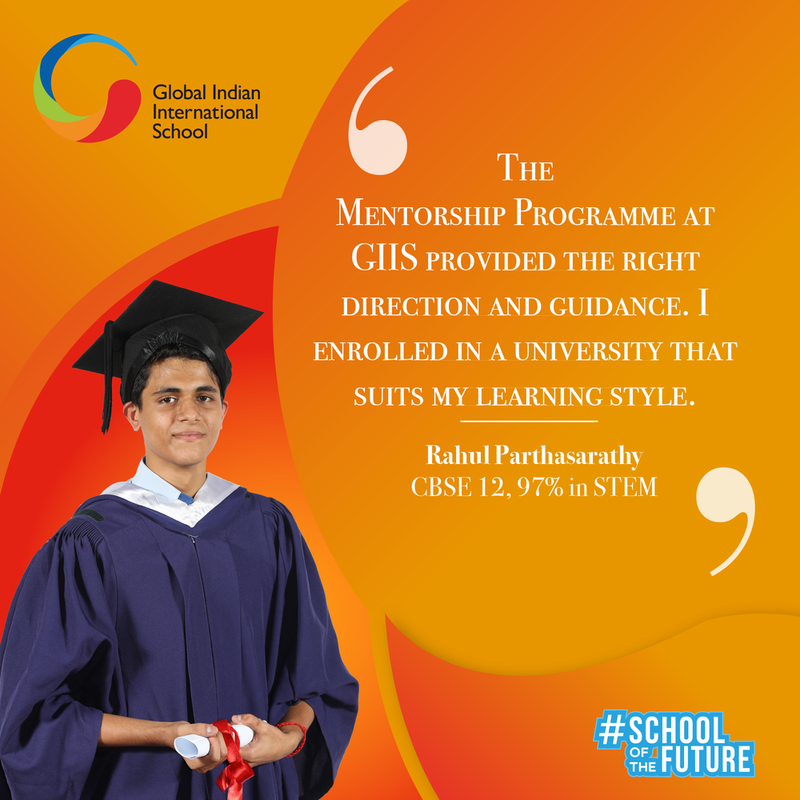 GIIS Congratulates Rahul Parthasarathy, for scoring 97.3% in STEM subjects. He is joining a Singapore University for higher studies. He feels SUTD will offer him the same comfort and guidance that he found in GIIS. Rahul was guided by his teachers in choosing a university that suits his learning style & interest.